There are no math prerequisites beyond those used in shopping and that which allow you to balance your checkbook most of the time. Nevertheless, some students get very anxious about any math at all. So we want to show you here just what you need to know before entering this class. After you review the basic ideas below, take the math review test. 1. The Multiplication Table. Many years ago you encountered multiplication for the first time. Although we have the power of today's calculators, the following basic results are part of general knowledge. If you do not know the following table, you should fix that now before you begin with our class. You should not have to depend on a calculator for everything since that can slow you down and obscure the physics. Many quantitative questions you enounter in this course are designed with the above multiplication table in mind. If you have the above fundamental math facts memorized, you can concentrate on the science and not be burdened with fumbling around for a calculator. Below are two examples. 2. Shopping. Back in the 1970s, one of your family members goes out to purchase vintage toy Barclay cars dating from the 1950s. She finds that each car is available for $2.00 (including the tax) from a dealer. She has $25.00 and wants to get as many cars as possible. How many does she buy and what is her change? Did you figure out that she can buy 12 cars and that she receives $1.00 in change? This question is actually more difficult than the typical one you encounter in this course since she receives change. Something more characteristic of our course reduces to a question like this: given a = b x c where a = 24 and c = 2, what is b? The answer is 12. Note that if we write a = bc, it is implied that we mean b multiplied by c.
Our buyer was careful not to let children play with these cars since the paint they used back in the 1950s contained lead. 3. Investment. Again, back in the 1970s our buyer is out looking for Barclay cars. She has $20.00 and finds another dealer selling the cars for only $1.00 each. Little does she know that her descendant, namely you, will inherit these cars and be able to sell EACH of them on eBay years later for the total amount originally spent on all the cars together. How much money is made by the family if the original $20.00 is used to buy as many cars as possible back in the 1970s and you sell all the cars, each for the total amount she spends? Neglect the decrease in the value of the dollar due to inflation. Here is the answer. First you figure out that our original buyer purchases 20 cars since $20/$1 = 20. Remember that the cars cost $1.00 each. Then you sell each car years later for $20. Therefore, you take in $20 x 20 = $400 in cash from the sales. The family earns $400 - $20 = $380 on its investment, neglecting inflation. 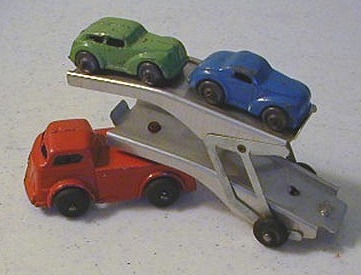 On July 31, 2001, the cars and truck pictured above, auctioned by snowboy (706) on eBay, went for $92.00.